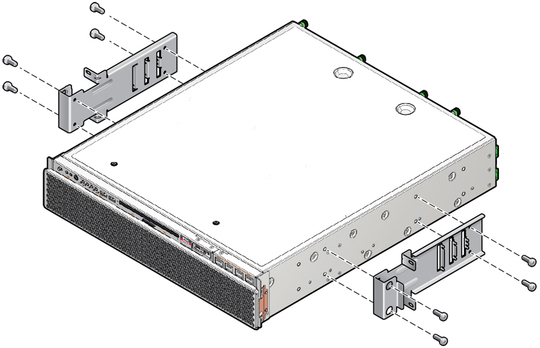 Note - The 19-inch, 2-post rackmount kit supports rack web thicknesses (the width of the rack post) of 76.20 mm (3 in. ), 101.6 mm (4 in. ), and 127 mm (5 in.). Read the Cautions for racks. Using four of the M5 x 7 SEM screws for each side bracket, secure the side brackets to the sides of the server. Lift the server into the rack. Using two screws for each bracket, secure the front of the server to the front of the rack. The size of the screws varies, depending on your rack. 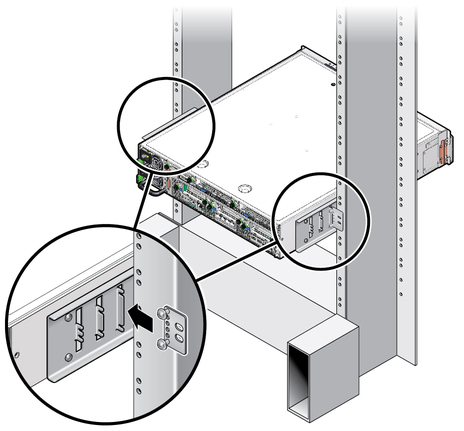 (Optional) If your environment contains especially high vibrations, install the rear plates to further secure the server to the rack. The rear plates attach to the rear of the post and to one of the three sets of eyelets on each side bracket, depending on the thickness of the post. Using two of the M3 x 8 SEM screws for each rear plate, loosely install the screws in one of the six positions on the rear plate. 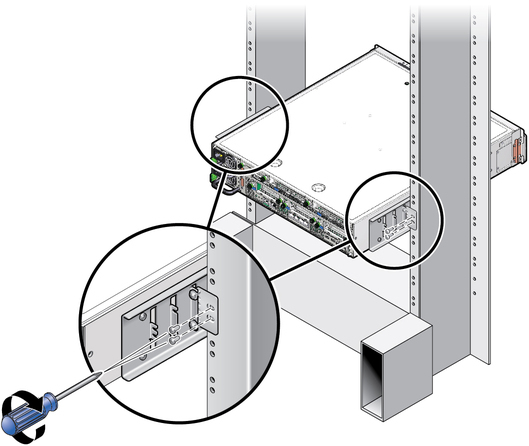 The position varies depending on the thickness of the rail in the rack. 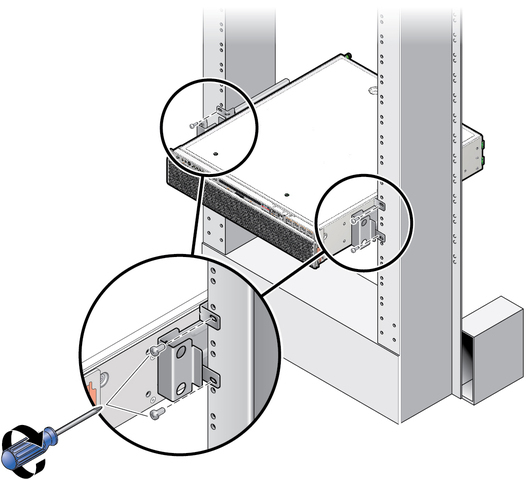 For example, the following figure shows where you would install the screws for the optimum rack position on the rear plate. Slide the rear plate in so that the screws slide into position into one set of the eyelets. The screw heads should be facing the rear of the server. The other side of the rear plate should be in front of the rack post. Tighten the screws to secure the rear plate to the set of eyelets on the side bracket. Using two screws, secure the other side of the rear plate to the back of the post. Secure the rear plate on the other post. Repeat Step a through Step d.